Each year, my besties and I have an annual gift exchange (almost 10 years running!). While we buy a gift for one person, sometimes we share little goodies like nail polishes, ornaments and of course my annual Christmas mix tape (I mean CD!). This year, Reader Lindsay gifted us with these adorable broom ornaments. I thought I would share this with you all as a potential DIY project for next year or a Happy New Year present for January gatherings. 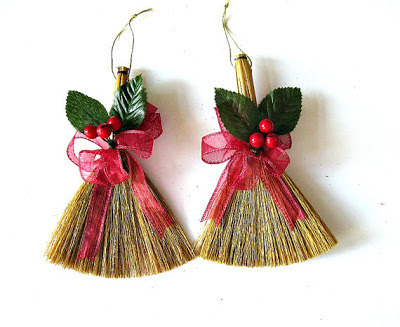 I did a quick search and the metal brooms may be a bit tricky to find, but there are real brooms that you can decorate like the one below from Etsy. Cheers to closing the books on a fantastic 2012 and here's to an even better 2013!